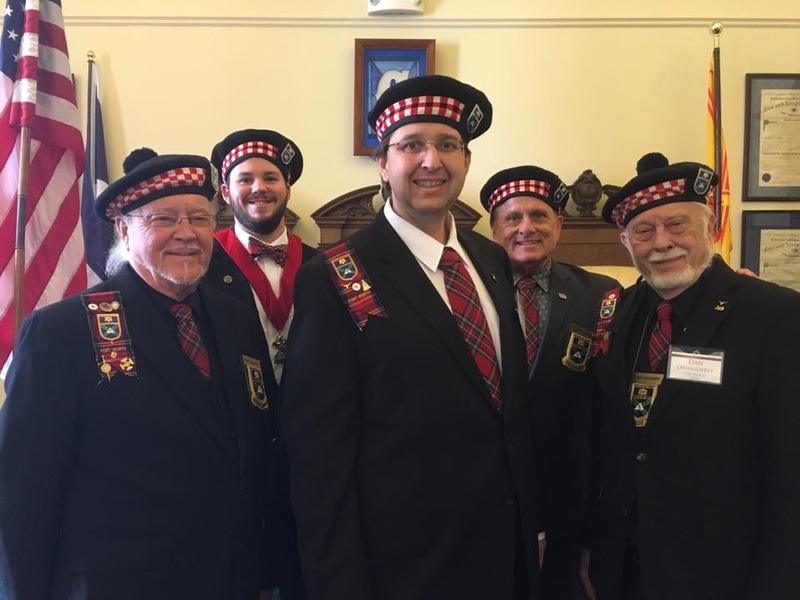 The Knights of St. Andrew (KSA) are a black hat organization in the Scottish Rite, offering 32° “black hat” Scottish Rite Masons an opportunity to get involved in leadership, meet members, and in turn, get known themselves. The Orient of Nebraska hosted the 3rd Biennial Gathering of the Knights of St. Andrew this past May 20-21, 2016 at the Omaha Downtown DoubleTree hotel. The roots to the Omaha Gathering really go back to April, 2012, when the Valley of Guthrie hosted the first Gathering during their Spring Reunion. The vision was to improve communication through KSA Chapters (though each KSA is its own organization), equip the KSA’s to better serve their Valleys, and increase the organization’s effective support to Valley philanthropies. Nebraska sent twelve Knights to Guthrie from Omaha and Lincoln, making the Orient the largest out-of-state delegation attending. During the breakout sessions, Omaha members made their mark by leaping up at every opportunity to say how we did things in our Valley and why it worked so well. Toward the end of the event, Dan Flynn, from the Valley of St. Louis and one of the event organizers, said “You Nebraskans like to talk (he might have said this somewhat more bluntly). Since St. Louis helped arrange this first Gathering, we are hosting it in 2014, but Omaha has it in 2016.” And that is how the 3rd Biennial KSA Gathering came to be in Omaha! Nine of us from the Valley of Omaha went to St. Louis in 2014, armed with Save the Date tote bags and matching 2016 KSA Gathering shirts. So the Omaha Gathering has been in the works for more than four years! From the outset, the goal of the 2016 Gathering was to inspire service and leadership among black hat Scottish Rite Masons, providing tools that members could use to engage volunteers, promote Valley leadership, support the Valley through philanthropy, and build their KSA into an active organization. John Hinck, 32°. John is serving as Grand Chaplain for the Grand Lodge of California. We wanted a speaker that would draw and interest Knights and help attract attendance. Stan Dodd, 33° from the House of the Temple Membership Services office, suggested Brother John Hinck, 32°, from the Orient of California. John Hinck is a retired Colonel, having served more than 20 years with the U.S. Army as an Apache Longbow helicopter pilot, Battalion commander in Afghanistan, with command experience around the world. John is a Doctoral candidate in Leadership Studies at the University of San Diego. John is founder of Strength and Honor Solutions, a company which develops tailored solutions to strengthen organizational and individual practices, while honoring personal values and company cultures. John is also currently serving as the Grand Chaplain for the Grand Lodge of California. He presented copies of his book “Strength and Honor” to members attending, with stories of leadership, character, and values. Armel MacDonald, 32° KCCH leads a session on growing Valleys' Chapters of the KSA. With John’s overall theme of leading with values, the KSA Gathering committee sought to build breakout sessions that addressed particular aspects of leadership: Brother Hal Daub, 33°, former Mayor and Congressman, spoke about the habits of effective leaders. Andrew Muska, 32°, spoke about engaging volunteers, David Douglas, 32° discussed proper management of events, and I spoke about organizational fundraising, development, and donor stewardship. John Hinck led two breakout sessions, addressing why members join and remain in organizations, while Don Kavalec, 32° KCCH spoke about implementing VMAP in the Valleys. Armel MacDonald, 32° KCCH led a conversation about how to grow and develop the leadership of members’ KSA Chapters. We were also honored to welcome a panel moderated by Brigadier General Don Bacon (USAF), who led a conversation with Col. Eric Van Sky (USAF), CAPT Gary Williams (USN), and Lt. Col. Mike Precella. They spoke about military leadership, what styles worked – and didn’t work - how these leadership styles affected them, and how they led themselves. All the officers are retired, and Eric Van Sky, 32°, Gary Williams, 32°, and Mike Precella, 32° are members of the Omaha Valley, while General Bacon is a candidate for Congress from Nebraska’s Second District. As important as each session was, the breakout sessions were also designed to be interactive conversations rather than lectures, with brethren discussing what works in their Valley and learning about best practices in other Valleys. With a great line up of programs, we needed a strong attendance. Armel MacDonald, 32° KCCH and Don Kavalec, 32° KCCH, both Past Venerable Masters of the Omaha KSA, got on the phone, calling General Secretaries in every Valley within 500 miles of Omaha, and we sent fliers to the three Leadership Conferences in Houston, Phoenix, and Charlotte. Additionally, we sent mailers to every General Secretary and SGIG in the Northern and Southern Masonic Jurisdiction last summer, fall, and again this Spring! We were very surprised when we had 72 Brethren and 13 Ladies register, representing 26 Valleys and 16 states at the May 20-21st Conference. Some Brethren had attended the St. Louis and Guthrie Gatherings, and others were here to learn how to start a new Chapter of the KSA In their home Valley or reinvigorate existing Chapters. The KSA Gathering kicked off on Friday evening with a Texas barbecue banquet at the Downtown Doubletree. Stan Dodd, Assistant Director of Membership Services from the House of the Temple spoke, challenging members to think about how to engage members. M.W. Dennis Rix, Grand Master of Masons, concluded the first evening, bringing greetings to the Gathering from the Grand Lodge of Nebraska, and extending his congratulations and a welcome to the members. The Maryland Knights present the colors at the opening ceremony on Saturday, May 21. On Saturday morning, the Valley of Guthrie hosted a beautiful opening ceremony, directed by Brandon Boughen, 32°, with a piper from Omaha Pipes and Drums. Brethren from the Valley of Baltimore presented the colors, and Venerable Master of the Omaha KSA David Meinzer, 32°, gave an opening invocation. Breakout sessions followed in the morning. At noon, we broke for a pasta and lasagna lunch. John Hinck, 32°, was our keynote speaker, speaking eloquently about how his Freemasonry serves as the foundation for his life, whether as a soldier, student, teacher, father, or son. He asked us to define leadership and their passion, answer the statement “I am. . . “ and describe ourselves. He left us with the challenge to use the descriptions of how we would describe ourselves as the inspiration defining the “I am” statements. After afternoon breakout sessions, members arrived at the Valley of Omaha Scottish Rite for a prime-rib farewell banquet, prepared by our own Culinary Masters, while we watched Celebrating the Craft. Besides our own 85 Knights, an additional 50 Scottish Rite Masons and ladies attended Celebrating the Craft, which raised over $3,000 for the House of the Temple and Nebraska RiteCare. Like us on Facebook at: https://www.facebook.com/KSAGathering/. Besides a chance to learn from one another, we made great friends with one another, connecting on Facebook, SR Chirp, and Twitter, and we continue to stay in touch, sharing ideas. There is already buzz for the 2018 KSA Gathering. The Valleys of San Jose, California, Las Vegas, Nevada, Waco, Texas, and Savannah, Georgia are vying for the honor of hosting the next Gathering. Information about how to vote on the next jurisdiction will be made available soon, and the presentations and materials from the Omaha Gathering, as well as swag for sale from the KSA Gathering, will be posted on our website at www.scottishriteomaha.org/ksaomaha-1.